The P8XBlade2 is the first member in my latest family of tiny Propeller Based Microprocessor boards. The EEPROM is pre-programmed with code to boot from the microSD card (user supplied) which will normally contain some form of operating system such as my free PropOS. It also works with a cheap USB-TTL CP2102 using the linkable transistor reset circuit as an alternative to the PropPlug. 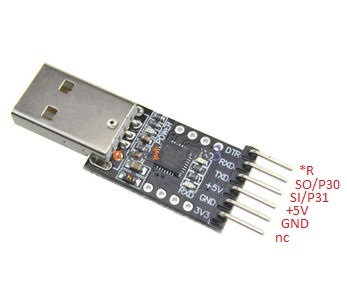 +5V power can be provided by the USB-TTL board. The P8XBlade2 can be used as the basis of any Propeller Development System. Together with a microSD card formatted with FAT32 and loaded with my free PropOS (Propeller Operating System with similar commands to the old PC DOS and CPM), the Prop will boot into PropOS, or run a user program, without the need for an expensive PropPlug. US$4.00 Packing & Post via Unregistered Airmail Postage from Australia. Please allow up to 28 days although it usually takes about 14 days to most countries. Any import duty and taxes, if applicable, are to the purchasers account. Win7 and IE10 + Firefox do not have the "attach" option when editing this post. They do on the first post. Another great board Ray, I may have to play with that one. I noticed your web site is down. Updates going on? Perhaps I was modifying my website at the time - should be good to go although I am in the process of rewriting it. _os_v080_20151215_P8XBlade2.zip has the files required in the root directory on the microSD card FAT16/32 directory. _os_v080_20151215_P8xBlade2(source).zip has all the files required to build PropOS including the compiler Homespun. Looks like the website is back up. Looks like the perfect New Year's present for me!! Happy New Year to me!! Nice board! Can I resist buying one? I have a limited number of these CpuBlade7's 2"x2" (~50x50mm) boards available. This was a prototype and there will not be any more of these. Note to use the microSD it is required that part of the Raspberry Pi interface pins be cut out. There are a couple of NPTH holes to help with this. The P8XBlade2P (P=Prototyping Board) due January will be an exact P8XBlade2 replica (no microUSB) plus the prototype area with Raspberry Pi and Arduino footprints. Specify if you want the microUSB fitted or not - same price. Does that mean you have USB operating on P1 ? Ray, is the $4 shipping per board or will $4 cover a couple boards? It's OK either way, I just want to cover the right amount on my order. I'd like 2x blade2, 1x blade7 and one SD (just so I have a master). Just verified it works fine using the optional transistor circuit (link QE) with a generic USB-serial(TTL) using CP2102 with DTR and powered with its 5V. DO NOT CONNECT the 3V3 as its an output on both boards and the CP2102 CANNOT supply sufficient current anyway. Yes, a single p&p will cover these 3+SD. It will be near the limit I think. Any idea what the postage would be to uk? How do we order- cant see an order form on website so- pm and paypal? I think $16 would just about slip under the UK customs radar - I don't mind paying the UK tax, its paying as much again to have the postie collect it!!! Pay via PayPal and send me an email please (or just include a note with PayPal). I just noticed that your schematic indicates the SD being connected to pins 12-15, but your OP states 11-15. Very nice!! What linear regulator are you using? Have you measured your current with all cogs sleeping, unused pins pulled high? I wonder if this would be good for battery projects. I guess it ships with a boot loader in the EEPROM to allow it to boot with your OS. Can I guy download a normal SPIN application to the EEPROM with the propeller tool? I think the price is great!! Yes, you can use the board without the SD card. The board has a pair of vias that must be linked to enable writing to the eeprom. Where did you get the CP2012 module? Predictably, the dozen or so I have all came from China via eBay. Seems we have two choices: Order from China or order from someone who orders from China. You'd go broke making them domestically. I see what you mean. At $1.79 including shipping I can't imagine how any profit is being made on these. Thanks for the link! The 6-pin cable is worth $1.79 with free shipping! I posted a link to the one I used a few posts ago. I guess I missed that link. Sorry. So, since the Pimoroni Prop HAT has reverted back to its normal price of £15 (£25 for 2 ! ), we now have a new reigning champion for cheapest Propeller board. Yeah, Cluso ! But, uh... fellow Americans, this embarrassing. Except for Parallax, we've got slim pickins. Even the RoboProp (not a contender for cheapest, but it gets extra points for its Pi header) is from Canada. With DIP Props having been on backorder for so long, Cluso new board is a godsend.